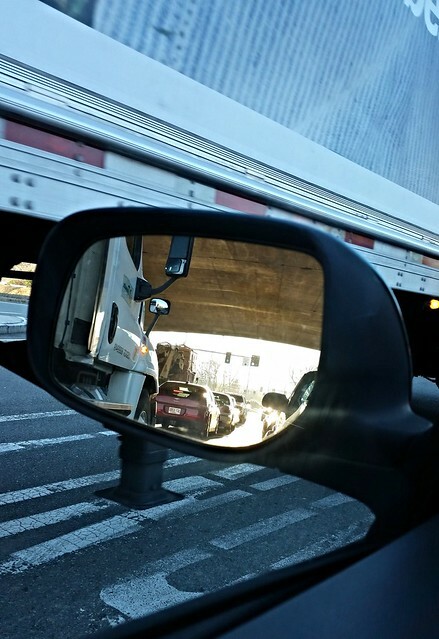 Photo Reflection of the Day #244: What's In the Rearview? A shot of my driver's side mirror capturing the truck that's also currently passing me beyond the mirror. Some shots come to you in a flash. Initially, my interest in this shot was the contrast of shade where my car sat in traffic and the reflection in the mirror, which showed such a bright and sunny world. The contrast was fantastic. So I took out the phone and took a few shots (we were stopped in traffic--to be clear). However, the oncoming traffic began moving and I figured I would keep taking pictures to see what I got. This photo was the best of the lot. If you look, you see there is a truck beyond the mirror and there is the head of a truck in the reflection. However, these are not the same truck, but rather 2 different trucks.